The first thing you’ll notice The Spaces Between is the high density of the current mechanic. 8 new currents have been released, all at once, and it’s up to us to decide which ones we are going to fit into our decks, and which ones should be left on the sidelines. What complicates the evaluations of currents more than those of other cards is the way in which they interact with each other. Does the power level of currents go up or down when more people play them? On the one hand, if your opponent is playing currents, you can use your currents to cancel out theirs, and on the other hand, they can do the same thing to you. In the end, what this is going to do is equalize the power level of the currents: the worse currents get better (the runner’s), and the better ones get worse (the corp’s). On average, if your opponent’s current is more damaging to you than yours is to them, replacing their current with yours is going to matter more than when they replace yours with theirs. Also, corp currents are better in decks with fewer or harder to steal agendas, because they’re less likely to get turned off quickly. That being said, let’s jump into the actual cards. As always, I’ll evaluate the cards on a 0-5 scale, taking the metagame into consideration for the ratings, and any card that I think has potential to change power level dramatically with new releases will have their ratings marked with an asterisk. This new HB identity has a very interesting ability that will lend itself to some cool new strategies in the future, but right now, I don’t think we have enough support to justify playing this over EtF, which has what is likely the most powerful ability of all corporation identities. There are two obvious synergies with the ability to duplicate all of your ICE: Grail ICE, and NEXT ICE. The issue we have right now is that we’re lacking 2/3 of the playable Grail ICE, (sorry Excalibur), and 1/3 of the NEXT ICE. I don’t think that outside of this gimmicky style of build there is a very good reason to play this ID over EtF. When we get the full set of Grails, I think it will be time to give this ID a try. Being able to double up on the ICE that you draw means that not only do you get to power up your critical-mass ICE, but that you don’t need to play as much ICE in the first place, which is a huge boon for any corporation right now, as deck space is extremely tight on that side of the table. 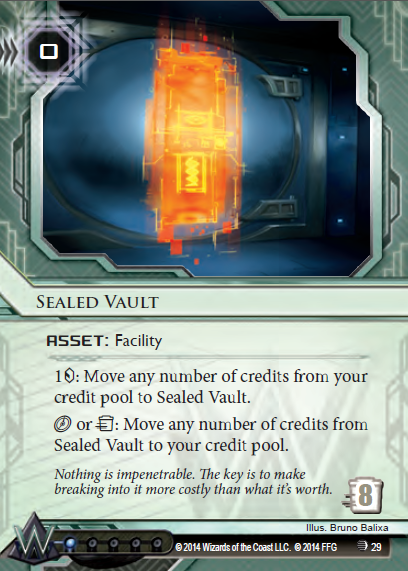 When we have the ability to stack The Foundry decks with 9 Grails and 6 NEXT, that could very well be all the ICE you need, freeing up space for more Biotic Labors, Ashes, Enhanced Login Protocols, and whatever other non-ICE non-Agenda non-Economy cards you always have trouble fitting into your corp decks. The influence of the Grail ICE would be very problematic in any other faction, but HB, thankfully, is the corporation which is least dependent on splashes to function, so this ID could still be fine even if you have to spend 12 of your influence on Jacksons and Grails. I’ll start off by saying that I think this is potentially the best current. One of the main disadvantages of currents in general is that your opponent can potentially turn them off very quickly after you play them, which is a huge tempo hit. Login protocol has the advantage of protecting itself: if the runner isn’t playing a current to cancel it out, they will likely have to make natural runs to get to the agenda they need to steal to turn it off. 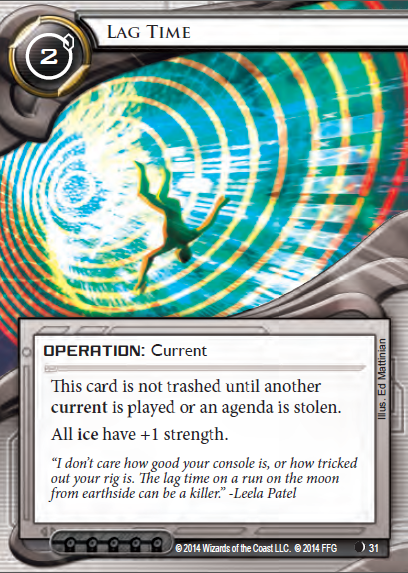 If this card stays in play for 4 turns or so, it’s quite good, probably dissuading at least a couple of runs, nerfing Security Testing, enhancing the power of your Bioroid ICE, and just being an overall good economy trade for the corporation. 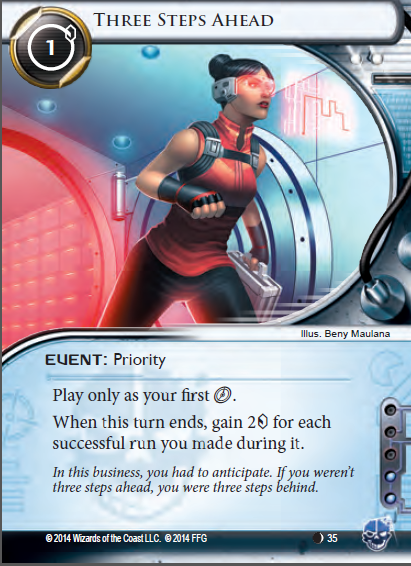 It should be noted that this card is meta-dependent: if the runners are playing currents, this card is not very good, as you’ll be paying money to play it, and corporations can’t afford to have do-nothing cards in their deck, especially do-nothing cards that you have to pay 2 and a click for. If your opponent becomes a Net Celebrity after you enhance your protocols, consider it a pretty serious blowout. 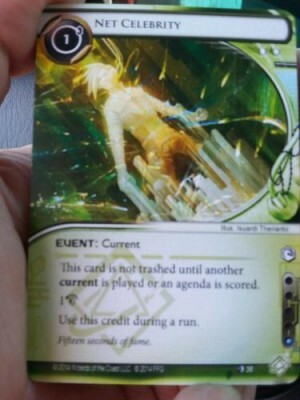 However, if there isn’t a lot of Gabe in your meta, (Sneakdoor makes this card look a lot worse), not a lot of people are playing the Maker’s Eye, and runners aren’t playing currents, this card is worth a try in any HB deck that you can make room for it in, which should be most of them considering the overall strength of HB economy. Personally, I’ll leave this one out for a few weeks until the current-hype dies down, but it could be a reasonable try sometime in the near future. This is one of those cards that’s either going to get them, or it isn’t, and my suspicion is that no matter how hard you try, most of the time it isn’t. There are 2 reasonable ways to try to get someone with Heinlein that I see. The first is with Enigma: If you have Enigma as the outside piece of ICE on a server, especially an inconspicuous remote server with a single unrezzed card in it, (Heinlein), you could easily blindside an opponent and achieve a huge tempo swing. The second is with False Lead. 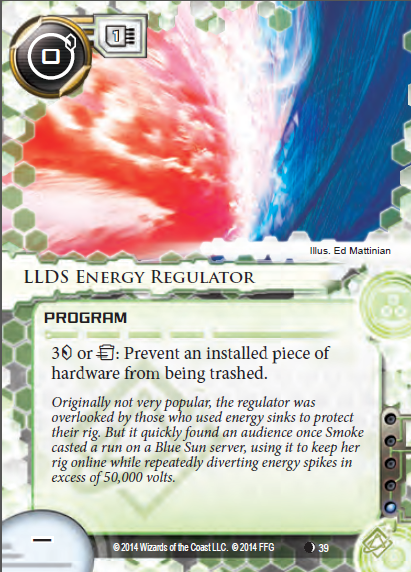 If you have False Lead scored, the runner will not be able to run on servers with unrezzed cards in them on the first or second click, empowering your Bioroids, (and if they make the mistake of running earlier, you can just blow them out, albeit at the pretty steep cost of a score agenda, $3, and a card. Heinlein’s power isn’t just limited to the blowouts though. You can just use it to make a server’s Bioroids unclickable, which is stronger with the larger Bioroids, though this power is going to be only about as good as making the runner trash an Eve Campagin or something. It’s just going to be too much work to make happen. In the end, I don’t think this card has what it takes to get there. 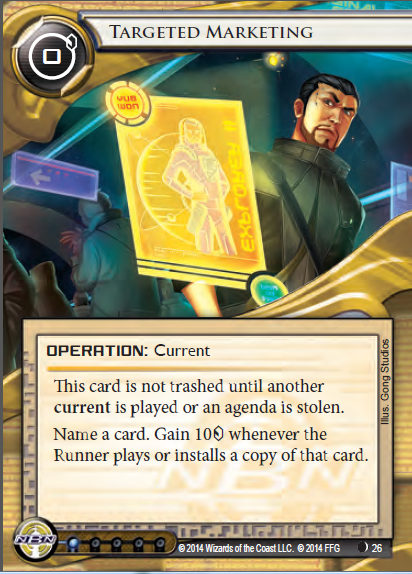 As always, non-ICE, non-Agenda, non-Economy corporation cards are hard to fit in decks, and this card isn’t at the very high power level you’re going to need to justify it. I don’t know where you’re going to try to fit this card, but it’s a bad idea. For this card to compete with House of Knives, Gila Hands, and Clone Retirement, you’re going to need to build around it. The trouble is, even after you build around it, it’s not going to be THAT much better than the alternatives. Strictly a for-fun sort of deal, I think, as the 3 Chum 3 Inazuma deck doesn’t have anywhere close to what it needs to fill itself out, especially in a Parasite-infested metagame. In a world where beating Andromeda is probably the most important thing for corporations, you can’t possibly play this card with a straight face. Even if Andy didn’t exist, even if no other currents existed, runner’s abilities aren’t powerful enough that it’s worth paying $2 to turn them off for a few turns. This, for me, is the both hardest current to evaluate, and the hardest one to play correctly. You can’t expect to trigger it very often: the runner isn’t going to play the card you name nine times out of ten. 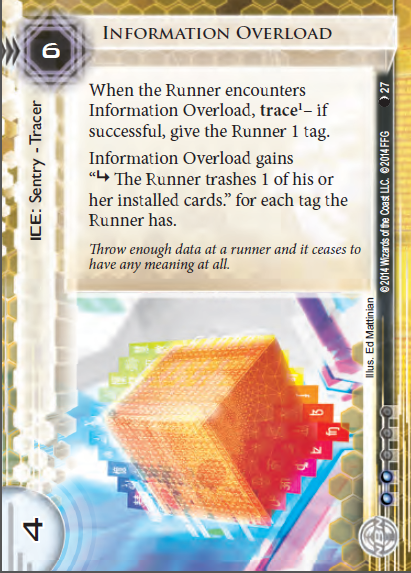 However, the ability to blank some of the runner’s cards for a while is potentially good enough. In the NBN vs Criminal matchup, you could name any number of things: Desperado, Corroder, Special Order, Account Siphon, or whatever else is going to be most problematic for you. You can put an Astroscript Pilot Program behind a Wraparound and dare them to get their Fracter. All that being said, I would be wary of including Targeted Marketing anyway. Even criminals have some amount of redundancy in their decks and tricks to get around ICE besides their primary breaker. You’ll probably be able to make the runner work around this card most of the time, and it’s going to be about worth playing in those cases, but the fact that it’s possible to work around it means that you can’t rely on it swinging the game significantly, (read: allowing you to score an Astro). Furthermore, it’s actually hard to decide what to name against Shapers and Anarchs, who could be playing any number of different viable options for doing what they need to do. You might even end up naming a card that isn’t in their deck, which is just a nightmare. Overload is either going to be a 1 or 2-of in Midseasons decks or it’s not going to see play at all. It has the advantage of having an ‘unbreakable’ subroutine, but if the runner doesn’t have tags, it isn’t going to be very good, as they can just pay through the trace or remove the tag after the run. Once you have lots of tags on them, this card is completely insane, but once you get to that spot, you’re usually winning anyway. The card you want to compare this to is Data Raven. For the cost of 2 more, you can force them to deal with it when they first encounter it, which is a reasonable tradeoff, and once you land tags on them, this card is much better, as they won’t be able to just run through it with impunity. Bottom line, I think this one is worth a shot in Midseasons lists. It might not be quite good enough, as it’s slightly worse than Data Raven if the runner has an RDI in play and is willing to plow through it for 2 accesses, but in a lot of cases, it’s going to dissuade people just as well, have comparable net startup costs, and be much better once the runner has decided to start floating their tags. 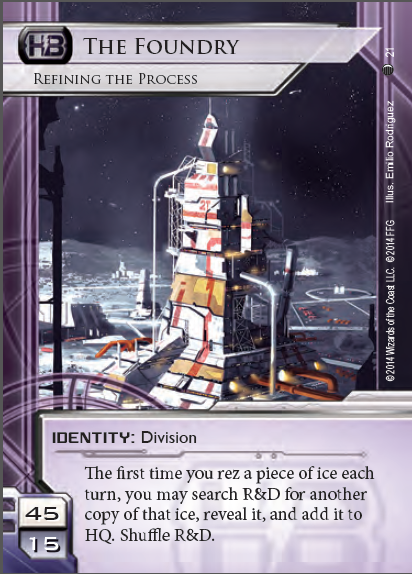 In Building a Better World, I think this card is definitely worth consideration over the alternatives, (splashed GLC or Subliminal Messaging), as it is both in-faction and a transaction. 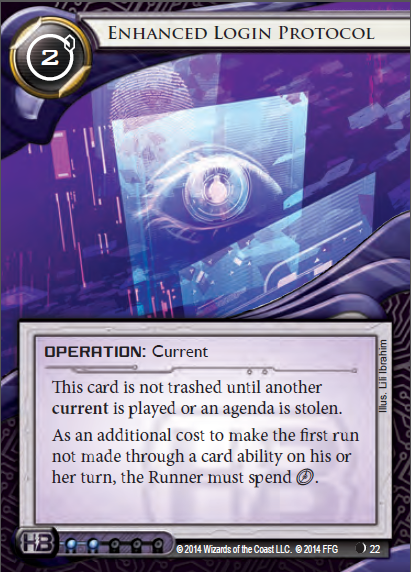 Between that, and the fact that it protects itself, (the runner has to make successful runs to steal agendas to turn it off), makes me think that this card is worth slotting a lot of the time. It will be varyingly better and worse than Beanstalk Royalties, and that card is basically an auto 3-of in BaBW, so you’re definitely going to want to try this current out. If Login Protocols don’t make the cut, this is going to be the best current, even if it isn’t a particularly exciting one. The new Account Siphon counter is reasonable, but nothing amazing. There are a number of problems with playing this card that will lead it to be relegated to only specific decks, and it’s doubtful how good it will actually be at countering Siphon in those decks. I’ll address the issues I have with this card one by one. 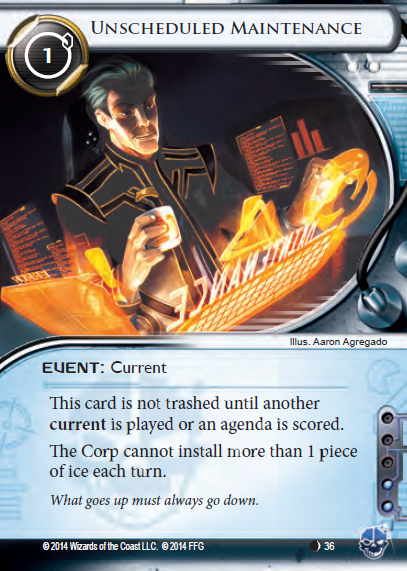 (1) It is a non-ICE, non-Economy, non-Agenda corp card, and for that reason, it will be hard to find room for it in the vast majority of decks. (2) This card is entirely useless if your opponent isn’t playing Siphon, and playing dead cards in your corp deck is really bad news. (3) Against criminal Siphoners, at the very least, this card is only going to effectively counter one Account Siphon, and at very little cost to the runner. If you install it in its own remote server, the runner just needs to accumulate enough money to run HQ plus $8, then they will just run your Vault after you move the money, forcing you to trash it, (or let them trash your money). They will get their HQ access and pay no more than it cost to run HQ. These things being said, I think you still might want to include this in some decks. If you can surprise someone with it out of Near Earth Hub, it could be gamebreaking, and you get the draw for playing it. 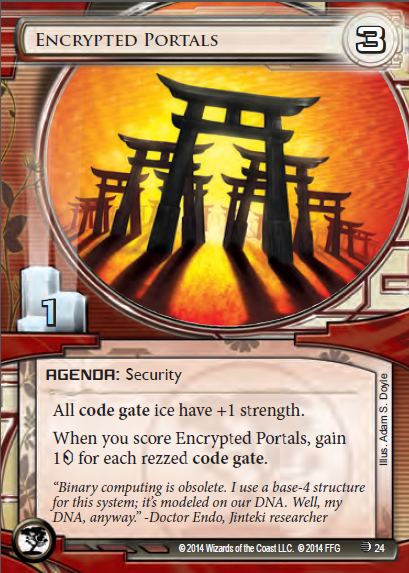 If you’re playing a horizontal Jinteki PE deck, this card not only defends you from Siphon, keeping your traps live, but it will also usually be a good surprise because of how often people will ignore your remote servers. In Weyland Tag & Bag, it’s 0 influence, though I suspect it’s not particularly good in that deck, (it’s easy to force you to trash it yourself post-Siphon and you have plenty of tag punishment anyway). I won’t be trying to jam this into too many decks, but it could be helpful in some. You can put one of these in The Red Coats for the time being. It competes well with Priority Requisition for value in decks like that, where you build big servers and try to survive to the long game. It’s also quite nice that you don’t really need to set this up as you do with Priority Requisition; I’ve often put off scoring a Pri Req because I didn’t have a big, expensive piece of unrezzed ICE on the right server when I was ready to score it. This can be pretty important, as you don’t want to let the runner know what ICE is on the table, and scoring a 5/3 takes two full turns, so you might not have time to get good value off the Pri Req. Overall, this is a pretty good option for a 5/3 outside of Jinteki, where you will just play The Future Perfect because that card is completely out of control. While this current does help to protect itself to some degree, I just don’t see how you’re going to fit it in decks. This is the current which will suffer most from the current “problem”, that you could very easily not get value from it before it goes away. Paying 2 for a card that does nothing or next to nothing is really terrible. 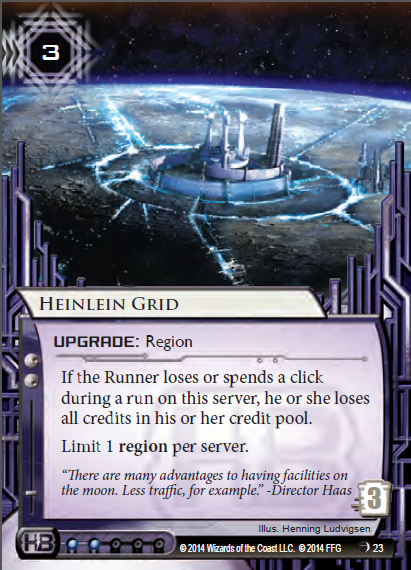 Even if you get the runner to spend an extra $6 or so, which you probably won’t be able to do a lot of the time, there was probably a better card, likely an economy card, that you could have used in this slot. One thing that this might let you do reasonably well is shut out an atman deck for a little while. Being able to dynamically change the strength of your ICE can be pretty good against that sort of deck, especially if your strategy involved locking them out anyway, (maybe in Tennin, for example). 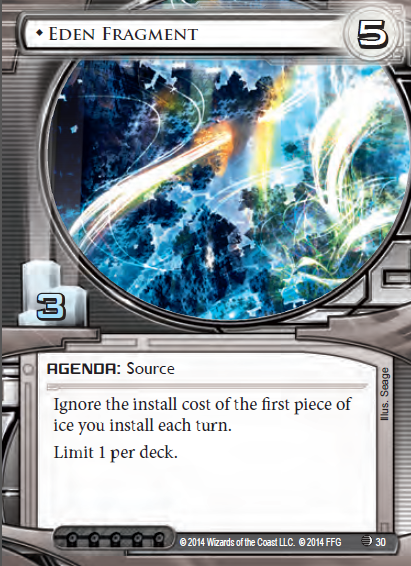 In those decks, I would consider giving Lag Time a try as a one of if your meta is riddled with Atmen, but I would leave it out of your generic glacier lists because there’s probably something better. I really wanted to like this card, and I think there might very well be a place for it in the future. The effect is powerful enough: being able to effectively trash a breaker can be a pretty big tempo hit. However, I am afraid that for right now, there just isn’t a great place for it that I can see. The decks that it’s best in are probably the decks that want to trash your breakers anway, probably using power shutdown and large destroyers. This will help you to accomplish that goal. However, the numbers on it are a little depressing. Having it trashed for one out of centrals is a big pain, and paying 4 for the one-time effect is good, but not insane. The thing is, insane value is what you need to get these days for utility corp cards, and this one has just been pretty good for me. 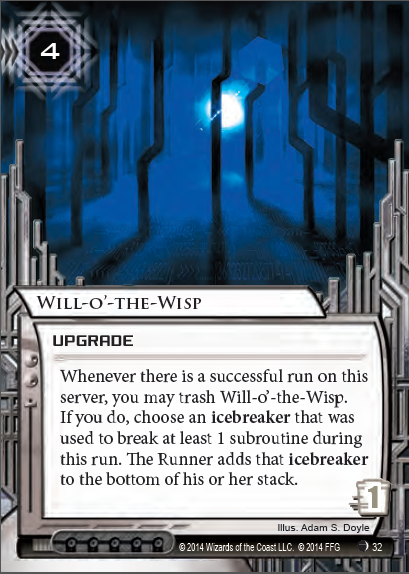 Luckily for the Will, it’s neutral, so you can get it into your Weyland/Jinteki/HB Power Shutdown deck without much effort aside from making the difficult cuts you need to fit it. Right now, I think the ubiquity of Parasite specifically is holding this card back. You really don’t want to put it in your remote servers too often because you don’t often want them to get into your remote servers successfully, and having it on your central, especially early, could easily be a waste if they Parasite the ICE that you were going to use to trigger the ability. I think this card has a powerful effect with a lot of potential, but it’s just not as insane as you think it is when you first look at it. David is a powerful but somewhat expensive answer to a lot of the problems generated by Anarch’s fixed breaker suite. Instead of playing Knight, you can play David now, and not have to worry too much about Tollbooths, Grims, Archers, and Lotus Fields keeping you out of servers. Right now, there really isn’t an Anarch deck that really needs to use this, though. The AI/Parasite-based Noise and Reina decks could make some use of David, but it’s really going to shine if Anarchs get a breaker tutor and more economy to achieve a setup akin to Andromeda. 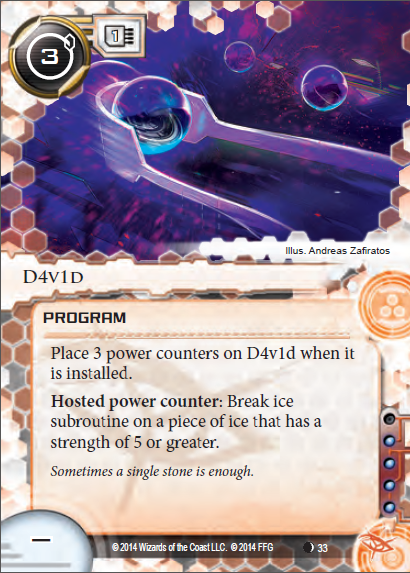 What David will do in those decks, is act sort of like an Anarch Faerie (protecting you from large destroyers) that has the downside of costing money but has the upside of breaking a lot of the more difficult ICE in the game for free. Conveniently, it’s in the same faction as Parasite as well as the fixed breakers, so it’s plausible that you could even jam it into the AI-breaking Anarch decks that exist now and have it do reasonable work breaking ICE you can’t quite Parasite, especially when you don’t draw a Datasucker, (though I think Knight is doing a pretty good job in that department right now, David is a lot more economically efficient if it’s large ICE that you’re facing down). David is definitely a powerful enough card, and Anarch is a wide-open enough faction that you can experiment with him different builds. 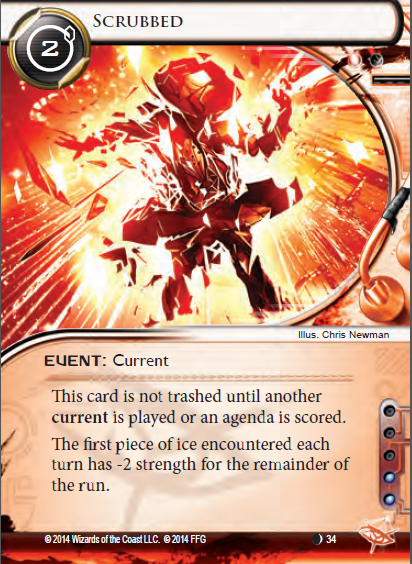 I like this card, and I think it definitely has a place in the future of Anarch, at least in certain metas. While this might look reasonable for a Parasite recursion deck, cards tend to run into a lot of trouble when they compete with the almighty Datasucker. Like Ice Carver and Bishop before it, Scrubbed is probably just going to stay in the box because it’s an inconsistent, more expensive replacement for a card you’re certainly playing 3 of already anyway. Don’t get me wrong, it works okay in conjunction with Datasucker to simply save you some tokens, and being able to work like a Datasucker when you don’t have one isn’t worthless, but the fact that Scrubbed can just be turned off by a Breaking News or something means that you can’t even count on it working for those purposes. I would just stick with Ice Carver for consistency, or better yet, just play Datasucker and be happy about it like you always did. Three Steps Ahead looks to me to be similar to something like Queen’s Gambit or Bank Job. If you’re playing Desperado and Security Testing, this could potentially be a very powerful economy operation. However, I think the fact that you won’t be able to consistently get great value off of this card will keep it out of most decks. The upside is pretty high, however, so you could definitely try it as a supplementary one-of sort of deal. The combo potential with extra clicks from Joshua B is also something to consider with this card, but the fact that they’re in different factions will keep that from being too much of a thing. Right now, I think I would just stick with Bank Job or Easy Mark rather than trying to get Three Steps Ahead. The best thing this card is ever going to do is cancel out your opponent’s current. Not worth it with ICE destruction. not worth it with Patel when she comes out, not worth it ever. 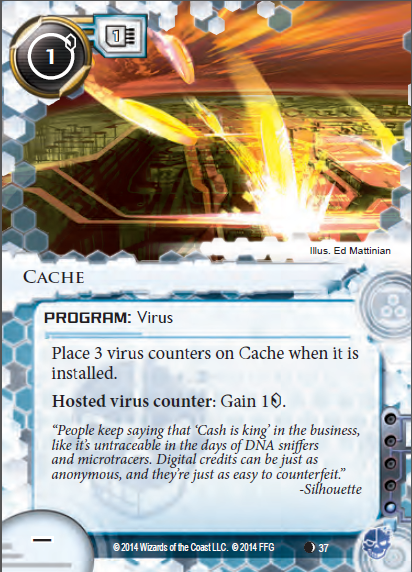 Cache is a pretty bad card on its own, but no one is going to play it on its own. The best synergies with Cache are, as it has been noted many times before, Noise and Aesop’s Pawnshop. It’s perhaps worth it to play Cache in any Pawnshop deck (especially Kate), or in any Noise deck, but it’s really going to shine in decks with both. Noiseshop has been ‘dead’ for a long time now, but Noise is positioned quite well in today’s metagame, so now is as good a time as ever to try to bring it back. The Noise deck I have been playing recently doesn’t use Pawnshop, (I prefer to use my Anarch influence to ressurect Parasites, play Account Siphons, or improve overall consistency), but this is a big power boost that will make revisiting the old strategy very worthwhile. Especially with the new Anarch box coming out in the fall, Noise is going to have a Cache of new toys to play with. It’s not going to be an auto-include by any means, but if you’re playing Pawnshop already, you’d have to be a little crazy not to try to fit a few of these as well. This is almost certainly the best runner current. The fact that it’s a simple economy card is great: you should be able to extract a good amount of value from it most of the time. However, it isn’t going to be the best economy card in the world, so you should only play Net Celebrity in two cases: first, if you’re having trouble with Corp currents in your meta and you want to cancel them out. Celebrity will recoup its cost immediately in almost all cases, so it’s sort of a freeroll in, say, an Atman deck that’s having trouble with Lag Time. Second, in Nasir, this gives you another source of recurring credits, which is great because you won’t be liable to lose the money to your own ability. Unfortunately, I don’t think this card is good enough to splash despite its low influence cost. 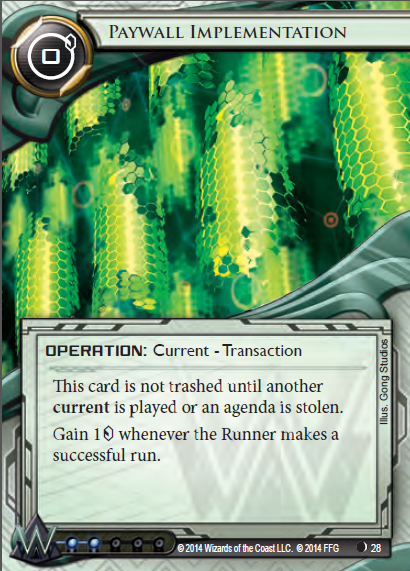 Cyberfeeder is generally better and in faction for Anarchs, and Criminals don’t tend to have the sort run-efficiency problems that this card helps to solve. Still, I think this could be a role-player, especially if the corp currents are popular. Hardware trashing isn’t in very many decks, and even if it starts showing up more, you’re better off with more copies of your hardware for consistency. Unless you start hosting your entire rig on a piece of hardware for some reason, this card is way too narrow to warrant play. It’s nice to see some more support for the stealth cards; I think that aside from printing strictly more efficient breakers, it’s hard to design new ways of breaking ICE that help us get away from the same old Corroder setups we’re used to. Granted, those problems are not as big today as they were a few months ago, but that mostly thanks to AI breakers like Knight rather than this sort of horizontal design. Thankfully, Lukas has a good understanding of this concept and I think that despite the difficulty of designing new breakers, stealth and things like it will be a factor going forward for the game. If we get another source of Stealth credits alongside this, it would go a long way towards making a primarily stealth deck work. We’ve already seen some of the upcoming Stealth breakers, and they look to be pretty efficient, but the primary concern right now is influence. With Stealth spread pretty evenly across the factions, cards like this are going to be exactly what Shaper stealth (assuming it will be shaper) needs to come into its own as a competitive deck. 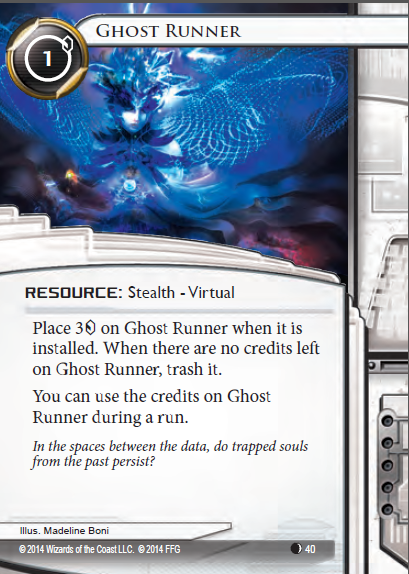 Ghost runner also has the added benefit of working well with Nasir and Aesop’s, if those cards end up fitting well into the Stealth mold. Overall, I think this is a somewhat underwhelming set, but that’s okay: we have some tools that are likely to be useful in the future, and a new mechanic to play around with and expand upon, even if it isn’t going to make major waves on the competitive scene. If nothing else, this set is quite well-balanced. It’s anyone’s guess as to which of the multitude of situational tools are going to first break into the metagame going forward. 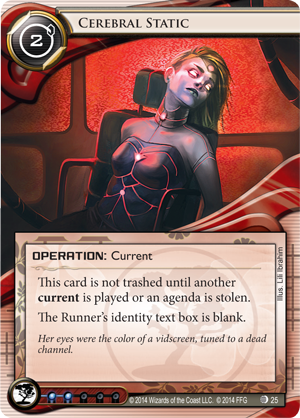 It’s also nice to see some reasonably powerful new runner cards in Cache and D4v1d, as it sometimes feels like that side of the table is getting no love whatsoever.